If only my dear sweet Mom, Mrs. Shirley Armstrong, could have lived to see this day! Our office staff had gathered around the live feed of this morning’s inauguration of the 45th President of the United States, cheered many of the accurate and touching sentiments expressed, particularly the ones acknowledging God’s Hand in the affairs of America and all mankind. We sipped a toast of Thanksgiving on this historic day, poured from a cold bottle of Champagne that my Mom had been saving for a special occasion. Even her little great granddaughter Anna, who she never got to meet, went around to clink glasses with everybody, even though hers only contained 7-up. I know this is a day Mom prayed for fervently, for the sake of her children, grandchildren and the generation yet unborn. No doubt, every human being has made remarks they’d like to have back (present company excluded, right?). Thankfully, most of us haven’t done that over a hot mike with cameras rolling, particularly when a cheap laugh was the only thing we thought was at stake. It’s a luxury fame doesn’t afford around lights and cameras. With any luck, lessons have been learned and hideous mistakes won’t be repeated. How is it that media outlets revel constantly in the never-ending game of political “gotcha,” and want to obsess over real or imagined “hurt feelings” when the stakes literally involve freedom or tyranny, life or death for countless millions around the world? The anarchists, haters of our Founders and Constitution may be having something of a nervous breakdown over the failure of their “movement” to complete their “open borders” dissolution of what appeared to be the last vestiges of an American identity. Some of us, in fact more than we dared hope, love and revere a nation that God ordained, and want to see it survive intact so that our children and their children have the chance to grow up as we did, in an environment of peace, security, law and order. If that’s a hateful concept to the socialists, anarchists and the anti-American faculty lounge set, then so be it. Wouldn’t it be nice if they’d just go someplace where their philosophy is already in practice and turn in their passports?! But that might prove a little uncomfortable, for obvious reasons. We’ll try not to enjoy the anger and frustration of mainstream anchors and their chosen analysts too much. That’s a spiritual downfall to avoid. The vitriol coursing through channels of social media is more vicious and hateful than ever. If you think the socialists, who thought they’d already succeeded in redefining the history and character of the United States are angry now, just wait a week or two. A great outrage has already been committed, and that was the deletion of U. S. “global warming” fears and policies on the official White House website. It disappeared at noon today. What a tragedy! Global warming is no longer the biggest threat to our national security? What will we do? As the newly minted President intoned in his inaugural speech today, the government will be attuned to the safety, security and prosperity of the citizens of the United States. If the truth turns out to be otherwise, we’ll know soon enough. But for now, let’s hope and pray that the President will execute his duties faithfully and honestly before the American people and before God. Certainly the invocations delivered just prior to his “swearing in” acknowledged God and His ability to bless or punish this nation and its leaders. Supporters and naysayers alike should be able to take heart in that certainty. Unless, that is, they reject the very notion of a Creator God. In that case, they’re on their own, and better find a therapy dog right away. Certainly the dangers remain. North Korea is reported to have installed long-range missiles on launch pads today. Iran is a vile and dangerous enemy of America and Israel. Russia has seized territory without warning, and has a president who may want to reconstitute much of the territory lost in the collapse of the Soviet Union. China has grown militarily aggressive, and is pushing the envelope by threatening Taiwan and dredging up islands in the South China Sea to act as military bases. Europe is now hostage to a hostile Muslim population that has no interest in assimilation, and leadership in Germany and the European Union tells its people they’re just going to have to adapt to the new situation. That fact alone may yet cause the undoing of the EU and the rise of the “Beast” power of Bible prophecy. But that’s a chapter that remains unfulfilled for now. The UN and the pope of Rome have taken it upon themselves to “declare” or “recognize” a so-called Palestinian state that does not exist. They’ve not only conferred “recognition,” but declared the border to include the Old City of Jerusalem, including the Temple Mount. Those of you who’ve had the privilege of visiting the area know that’s a complete impossibility, and no peace can ever be achieved under such circumstances so long as Israel remains a nation. Even Jared Kushner couldn’t make it work. If the Bible is to be regarded, declaring “Peace and Safety” in the hate-fraught Middle East could well be the worst thing in the world, regardless of best intentions. There’s no doubt, the whole world is in for a wild ride, ourselves included. As for us, we will pray for the safety and success of the new president and his family, and for all those who love God and country. Have a great and a joyous Sabbath. At this time of great patriotic fervour in the United States of America, and in many quarters of the world relief that eight years of feeble world leadership has ended, there is much to look forward to, though it may not be to everyone’s liking. 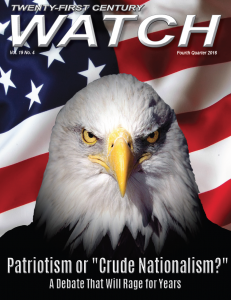 You can keep informed through many means but one way is a subscription to 21st Century WATCH magazine – FREE OF CHARGE. In the USA call (903) 561 7070, in Australia call 1300 885 066 or from anywhere email to gta.info@ozemail.com.au.